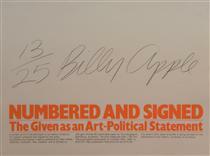 Billy Apple (ONZM) is an artist whose work is associated with the New York and British schools of Pop Art in the 1960s and with the Conceptual Art movement in the 1970s. He collaborated with the likes of Andy Warhol and other pop artists. 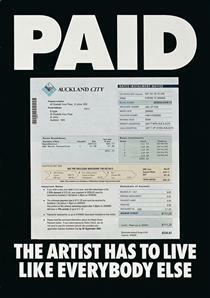 His work is part of the permanent collection of the Museum of New Zealand Te Papa Tongarewa (New Zealand), Auckland Art Gallery / Toi o Tamaki (New Zealand), the Christchurch Art Gallery / Te Puna o Waiwhetu (New Zealand), The University of Auckland (New Zealand) and the SMAK/Stedelijk Museum voor Actuele Kunst (Ghent, Belgium). Barrie Bates was born in Auckland, New Zealand in 1935. He left secondary school with no qualifications and took a job as an assistant to a paint manufacturer in 1951. Bates attended evening classes at Elam School of Fine Arts, where he met Robert Ellis, a graduate of the Royal College of Art in London. In 1959 he left New Zealand on a National Art Gallery scholarship. He studied at the Royal College of Art, London, from 1959 until 1962. During his time at the Royal College of Art, Bates met several other artists who went on to become a new generation of pop artists; including David Hockney, Derek Boshier Frank Bowling and Pauline Boty. He exhibited frequently during his time at the College in the Young Contemporaries and Young Commonwealth Artists exhibitions along with Frank Bowling, Jonathan Kingdon, Bill Culbert, Jan Bensemann and Jerry Pethick. In 1962 Bates conceived Billy Apple: he bleached his hair and eyebrows with Lady Clairol Instant Creme Whip and changed his name to Billy Apple. 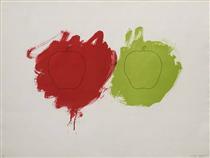 Apple had his first solo show in 1963 - Apple Sees Red: Live Stills - in London at Victor Musgrave's Gallery One. 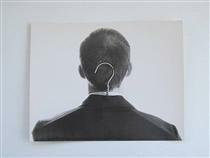 Apple moved to New York in 1964: he progressed his artistic career and also found work in various advertising agencies. 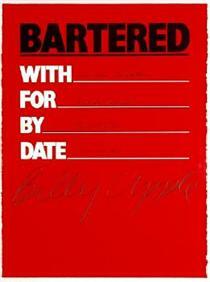 A pivotal event was the 1964 exhibit "The American Supermarket", a show held in Paul Bianchini's Upper East Side gallery. The show was presented as a typical small supermarket environment, except that everything in it — the produce, canned goods, meat, posters on the wall, etc. 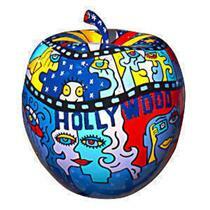 — was created by six prominent pop artists of the time, including Billy Apple, Andy Warhol, Tom Wesselmann, Jasper Johns and others. 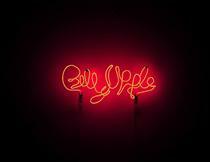 Apple was one of the artists who pioneered the use of neon in art works (Apples to Xerox and Neon Rainbows). 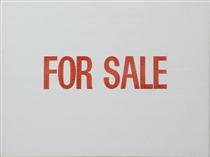 Other exhibitions and series include Art for Sale, The Given as an Art Political Statement, Transactions, Golden Rectangle, The Art Circuit etc. 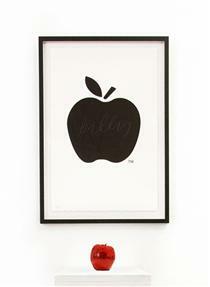 In 2008 Apple was the subject of a feature length documentary called "Being Billy Apple". 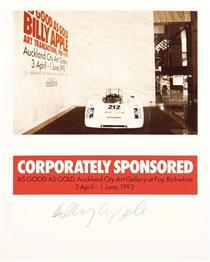 Billy Apple ONZM (born Barrie Bates in Auckland, New Zealand in 1935), is an artist whose work is associated with the New York and British schools of Pop Art in the 1960s and with the Conceptual Art movement in the 1970s. 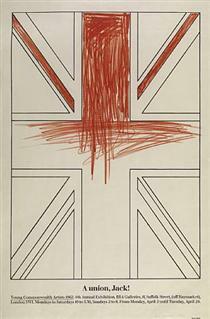 He collaborated with the likes of Andy Warhol and other pop artists. 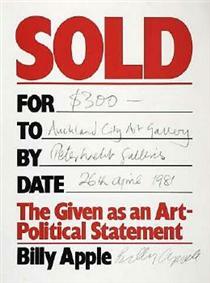 His work is part of the permanent collection of the Museum of New Zealand Te Papa Tongarewa (New Zealand), Auckland Art Gallery / Toi o Tamaki (New Zealand), the Christchurch Art Gallery / Te Puna o Waiwhetu (New Zealand), The University of Auckland (New Zealand) and the SMAK/Stedelijk Museum voor Actuele Kunst (Ghent, Belgium). In 1959, he left New Zealand on a National Art Gallery scholarship. He studied at the Royal College of Art, London, from 1959 until 1962. During his time at the Royal College of Art, Bates met several other artists who went on to become a new generation of pop artists; including David Hockney, Derek Boshier Frank Bowling and Pauline Boty. He exhibited frequently during his time at the College in the Young Contemporaries and Young Commonwealth Artists exhibitions along with Frank Bowling, Jonathan Kingdon, Bill Culbert, Jan Bensemann and Jerry Pethick. 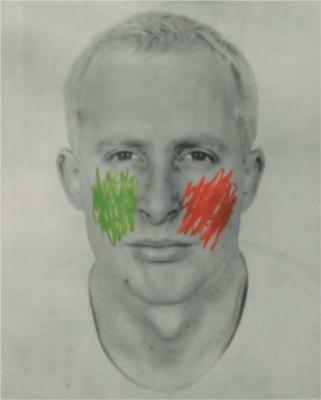 In 1962, Bates conceived Billy Apple: he bleached his hair and eyebrows with Lady Clairol Instant Creme Whip and changed his name to Billy Apple. Apple had his first solo show in 1963 – Apple Sees Red: Live Stills – in London . 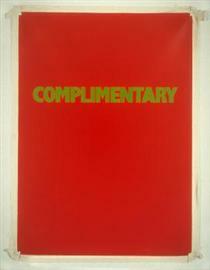 A pivotal event was the 1964 exhibit "The American Supermarket", a show held in Paul Bianchini's Upper East Side gallery. The show was presented as a typical small supermarket environment, except that everything in it – the produce, canned goods, meat, posters on the wall, etc. – was created by six prominent pop artists of the time, including Billy Apple, Andy Warhol, Claes Oldenburg, Tom Wesselmann, Jasper Johns, Mary Inman, James Rosenquist and Robert Watts. 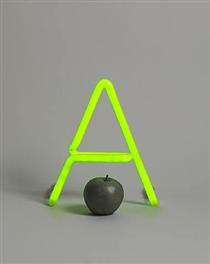 Apple was one of the artists who pioneered the use of neon in art works. 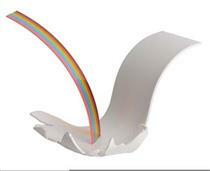 This is seen in the 1965 exhibitions Apples to Xerox and Neon Rainbows, both at The Bianchini Gallery. Then in 1967, the exhibition Unidentified Fluorescent Objects (UFOs), which showed a collection of neon light sculptures, was held at the Howard Wise Gallery, a fore-runner to the organisation Electronic Arts Intermix (EAI). One of Apple's UFO's was included in a 2013 exhibition that reconsidered the influence of Howard Wise Gallery. In 1969, the artist established Apple, one of the first alternative exhibition spaces in New York at 161 West Twenty-third Street in order, as he stated, "to provide an independent and experimental alternative space for the presentation of [his] own work and the work of others." Initially the exhibition space was part of his own studio. During its four years Apple produced 35 works in the venue and hosted work by other artists including Geoff Hendricks, Mac Adams, Davi Det Hompson, Larry Miller and Jerry Vis. The space was considered both an exhibition space and a forum for art and discourse.